On April 1, 2014 – just a few days after I had presented on Keynote 6 at Macworld in San Francisco – Apple produced significant updates for its three versions of Keynote – MacOS, iOS and iCloud. In addition to new builds, a topic I will explore when I get back to Australia (I’m currently in LAX waiting my overnight flight), and some other features, its Presenter display has undergone a major improvement. It’s one that pushes Keynote 5 (and before) further into history, and hopefully is a forecaster of more significant changes to come. Below is a video I created of some of the slides I used in my Macworld presentation. The story it’s telling is not important. What IS important is the screenshow of the Presenter display. Finally, the current slide – on the left – shows what is occurring in real time on the projected screen, i.e., the Mac’s output. Previously, you only got to see a still shot. When Powerpoint updated to its most recent version on the Mac, it very much emulated the look but not quite the feel of Keynote’s presenter display. Not quite known for its graphics abilities, nonetheless Powerpoint was able to show realtime movement, animation and movies on its Current slide, something Keynote 5 embarrassingly could not do. Perhaps today’s update to Keynote 6.2 has been hastened by the release of Office for the iPad last week; if so, that’s a good thing as competition for the best product and feature set will hopefully inspire better presentations. There are still some major holes in Keynote – missing Smart Builds, and some concerns about movies becoming distorted when they move, something I’ll delve into more detail next week. But at least now when you import a Keynote 5 file into 6, and there are incompatibilities, you get a more detailed listing so you can explore whether it’s worth the upgrade, or better to stay with Keynote 5, or rebuild your slidestack for Keynote 6 (see below for a screenshot of the improved reporting table). I have always dreaded the non-dynamic presenter screen, this is a great enhancement –thanks for sharing. I was shocked last night to see a MARKED improvement in redrawing. 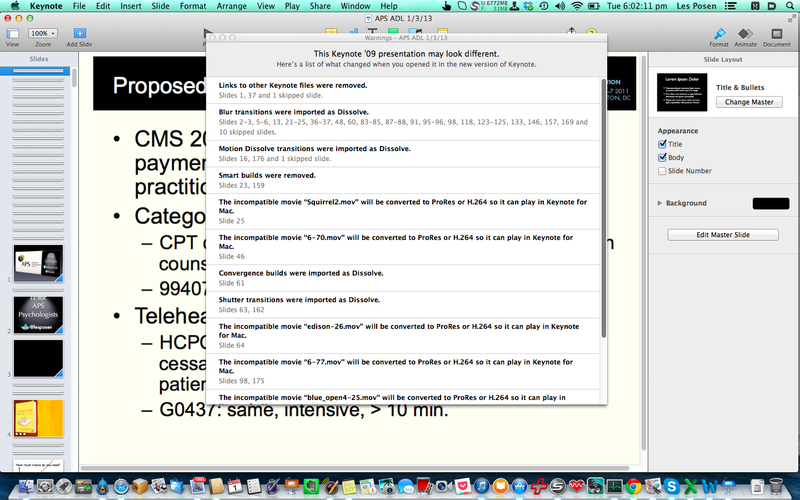 I use projected PDFs from students, mostly from my scans, that crawled along in Keynote 6. Also I’m excited to see new text animations, although I wasn’t able to locate them. The drawing tool that works on the presenter display is available when using the iPhone or iPad as a remote. Wow! I sure could have used that in class yesterday! The most glaring deficiency still hasn’t been fixed–inability to customize the presenter display! Not available ever before in Keynote, the ability to apply Magic Move transitions to an object containing text which differs in size between slides. Until now i needed a work around to do this, not any longer. Love it. What i love less is that the new Motion Blur preference setting remains grayed out on my 2010 MBA, despite this machine handling other complex effects graciously. I’d love to be able to access that Magic Move feature. When I select a text object as an object, I don’t see Magic Move as available. How is the Magic Move transition to text objects accessed? I don;t see that among the available choices. It’s a standard Magic Move. You set Magic Move (MM) at the slide level, not the object level. Just make sure that the same object is there on both slides. I always duplicate the exiting slide and then make the change, e.g. increase the size of a rectangle (with text). You can now increase the text size separately (in the past when you did this, Keynote couldn’t apply MM any longer). MM is set on the first of the two slides. I used to use this as a workaround before we had interactive charts. Nice feature. It seems Keynote 6.2 does not preview video playback in presenter view – unless I’m doing something wrong? I use keynote for public presentations, but the new keynote isn’t showing the FIRST animation build in the presenter display screen. On ‘next slide’ any text or pictures that are due to appear (on click) do not show – it’s blank. Thus the operator doesn’t know what is coming next. Only after ‘clicking’ does the text or picture appear, simultaneously as it shows on the ‘present slide.’ It only does this for the first build – any subsequent builds show on the ‘next slide.’ Does anyone know how to rectify this?